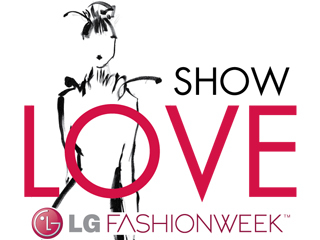 Yesterday, I was able to attend my first ever Fashion runway show during LG Fashion Week in Toronto. I've never been to a show before and I was incredibly excited. I won a contest on Twitter and brought along my friend Tara to see the show. We met up with her friend, Ashley and we one of the first people in the line for the runway. Essentially, we ended up second row centre; we were near the middle of the catwalk and I`ve been told that these were amazing seats. Oh yea, the show that we got to see was the 2011 OR by Angela Chen fall and winter collection! The collection was visually stunning. The first half of the collection highlighted a monotone colour scheme that balanced a focus on white and black combinations. Near the end, the outfits took on a fairytale aspect with ballerina tutus and more vibrant colours such as blue and baby yellow. The showing was very knit-centric and utilized the efforts of weaving to create stunning outfits. There were gorgeous pieces like the charcoal knitted skirt, the one piece long black and white dress, and the final ensemble which was a fairytale blue and baby yellow ballerina outfit. My descriptions probably aren`t providing you with a big enough detail to picture how the collection really was. However, I was able to record a little bit of the collection on my camera (my battery was dying) and I decided to upload the video for you all to enjoy. They`re about five outfits in the video which highlighted the feel of the collection and the colour scheme of the line. Don`t mind the video quality, it was hard trying to hold up the camera over the people in the first row. Overall, I loved the show and would love to go to another runway some time in the future. Thankfully, Tara said there`s another show in the next couple of weeks and if I want then I could go. If I do then I`ll bring along my camera to fill you all in on the festivities! If you want to check out other pieces created by Angela Chen and the rest of her line, visit her website by clicking the link: OrangeNYC.com.